Automated assembly systems are at the heart of your product's profitability. 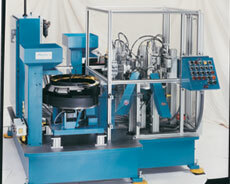 A good automated assembly system can improve your productivity and quality. We develop automated systems that work with plastic or metal components and that can perform metal stampings assembly, screw fastening, ultrasonic welding, heat sealing, metal welding, drilling & tapping, machining, gluing, riveting, laser marking, and much more. Our automated assembly systems also include robotic welding workcells, robotic assembly workcells and robotic pick and place units. Automated assembly systems can be beneficial in a variety of industries and applications. Nearly any process that joins or assembles components can be automated. Automated assembly systems are the key to a company's profits because an automated system can pay for itself in a short amount of time by eliminating labor costs and speeding up production. For further information or a free quote on automated assembly systems, contact Dial-X Automated Equipment, Inc.